Drury Going b. abt 1725-1735 of Brunswick County, Virginia. Appears to be the orphan who was bound out in Brunswick County. James Going b. abt 1683 possibly but – Unknown – (Note: based on assumed siblings, it appears these may be out of the Stafford County, Virginia group. But, on the other hand, there also appears to be a connection with the Underwood, Jackson, Lanier and Barber families that were from the New Kent County and Hanover County, Virginia areas – which is where Jack Goin’s line is from. So these may be out of that line). Thomas Gowen born about 1722 (In 1736 was bound to Ralph Jackson in Brunswick, Va). John Gowen born about 1723 (In 1736 was bound to Ralph Jackson in Brunswick, Va). Elsoner Gowen born about 1725 (In 1740 was bound to Ralph Jackson in Brunswick, Va). William Gowen born about 1726 (in 1737 was bound to John Straughan in Stafford, Va)(This William Gowen does appear to be out of the Stafford County, Virginia group based on where he was when bound out. If the other Goings in this group of “siblings” are in the line of Jack Goin – then William is not their sibling). Cave Gowen born about 1727 (In 1734 was bound to James Vaughan in Brunswick, Va). Drury Gowen born about 1729 (In 1740 was bound to Ralph Jackson in Brunswick, Va). (Note: Uncertain of this Drury Going’s parents or ancestry. I have assumed that all the Going/Gowen type names that were bound out in Brunswick and Fairfax/Prince William Counties, Virginia are from the same parents. This may be incorrect. Five of them, Thomas, John, Elsoner, Drury, and Cave – were all bound out in Brunswick County, Virginia within a few years of eachother. If their father had died, they would be considered orphans. It is possible that the mother bound them out to learn a trade/occupation. Catherine Padderson (widow of William Going b. abt 1682) and Cornelius Keith (father of Mary Keith who had married John Going b. abt 1700) signed as witnesses to the will of Thomas Stroud in 1738. So it appears the Going family may have begun their move down to the Virginia/North Carolina state line some time prior to that). (Note: Regardless of WHICH Drury this is, what was his relationship to James Goen? Both mentioned in Inventory of Underwood’s estate. Drury as having land adjacent to Underwood’s land, and James as a buyer at the estate. James Gowen b. 1720 m. Amy Gowing was living in Brunswick Co, Va at the time. He also had a son named James Gowing b. abt 1742 – so maybe it was the son at the estate sale – but either way – what was relation of Drury to this James Gowen? Was this James a brother of Drury – old enough that he did not need to be placed with a guardian or apprenticed when his father died? Or is there another relationship here?). 1) John Going b. about 1700 who married Mary Keith – his family lived in Lunenburg County, Virginia in the 1750s – in an area that later became Mecklenburg County, Virginia (This appears to be the John Going who was the son of William Going b. abt 1681 of Stafford County, Virginia). 2) Drury Going and James Going who lived in Brunswick County, Virginia that later becomes Greensville County, Virginia. (The parental line of Drury and James Going is unknown). 3) Edward Going, Michael Going, Thomas Going, and Joseph Going who were living further south in Granville County, North Carolina around the Tar River and Taylor’s Creek area (this appears to the be group of Going’s who came from Henrico and Hanover County, Virginia). 4) Alexander Going and his family who were living in the Orange County, North Carolina area. (Alexander Going was another child of William Going b. 1681 of Stafford County, Virginia). 5) William Gowen and his family who lived in the Bedford County,Virginia area. (The parental line of this William Gowen is unknown). 6) William Going m. to Anna Statia Sullivan, Moses Going, and Aaron Going living in Goochland County, Virginia. (The parental line of this William Going is unknown). 7) William Gowen and his family that lived in the “Grassy Creek” area of Granville County, North Carolina. (The parental line of the “Grassy Creek” Going family is unknown). (Note re Going/Gowen lines: At least some of the Going/Gowen lines appear to have come out of Gloucester County and New Kent County, Virginia. Unfortunately, records before the 1860s in Gloucester County, Virginia, and New Kent County, Virginia, have been destroyed. Some state-wide records prior to the 1860s from those counties, for land grants, indicate that some Going families were living in those counties. But since the county records were destroyed, it might not be possible to piece together where several of the above Going lines came from). Cave Gowen, a seven-year-old boy who was bound to James Vaughan by the 6 June 1734 Brunswick County court and Thomas and John Going who were bound out by the court in May 1739, no parent named [Orders 1737-41, 254, 302]. John Going and Thomas Going, apparently brothers, possibly other sons of Mary Gowing, were also bound to Ralph Jackson on July 5, 1736, according to Order Book 1, page 254. William Gowen, an orphan, age 10, was bound as servant and aprentice to John Straughan. Apprentice, 26 Oct 1737, Prince William, Virginia, USA. image: http://www.pohick.org/vestrybook.html . William Gowen – an Orphan – bound to John Straughan until 21 yrs – to be taught how to read English, and taught the ministry of a Tanner. 1-254 – July/August 1739 Court. 1740 April 3 ordered that Eleanar Going and Drury Going sons to Mary Gowing be bound as the law directs to Ralph Jackson untill they shall arive to the age of twenty one years. according to Order Book 1, page 302. Va. Court Order – Brunswick Co.
1755 Nov Ct John Maclin v Drury Going, Upon a Petition for thirty three shillings and five pence half penny due by account. The Deft having been duly summoned not appearing and the Plt making oath to his account it is considered by the Court that the Plt recover against the Deft his debt aforesaid in the said Petition mentioned and his costs by him in this behalf expended. (Margin calculations were – Costs 62 lb tobo costs, 26 Nov 1755. Order Bk 5, pg 493. Brunswick County Va.
1767 Sept 20 James Kuter v Drury Gowen cont till next ct Order bk 10, pg 492, Brunswick Co, Va.
John Underwood dec’d, James & Betty Solomon, David Adams, Jno Ballard, Peter Brooks, Sarah Brooks, Clack Courtney, Crawford & Co, Jno Doby, Nathl Edwards, Wm Edwards & Co, Richard Hay Jr, Richard Massey, Thomas Massey, William Massey, Jno Peeblees, David Mason, Alexr Watson. “very sick and Weak in Body” . . . To my wife Elizabeth – all my estate during her lifetime or widowhood & afterward then the sd land to my son[s] William & Sammons Underwood; William’s to join the lower line of Tomlin’s Run, Harrison, Second Branch, Drury Going, & all above that branch to belong to my son Sammonds. Probate indicates that sd Elizabeth Underwood refused to qualify, that sd Richard Hay qualified with David Sills & Richard Mason his securities. 1774 Jan 11 – Drury Goin Pheby Smith, Edward Freeman, Wall, Thomas Underwood, Elizabeth Underwood, John Burnett. 511-(201) Drury Goin of Meherring Parish in Brunswick Co to Pheby Smith of sd parish. 11 Jan 1774. £5. 50 acres on the south side of Meherring River, joining Edward Freeman, Wall, Thomas Underwood, Spring Branch. Wit: Edward Freeman, Elizabeth Underwood, John Burnett. Brunswick Co., Va.
1774 Jan 24 An indenture of bargain and sale between Drury Going of the one part and Pheba Smith of the other part was proved by the oaths of Edward Freeman, Elizabeth Underwood and John Burnes witnesses thereto and ordered to be recorded. Order bk 12, pg 492. Brunswick Co Va.
was taxable in Meherrin Parish, Greensville County from 1782 to 1801: taxable on an underage tithable, 2 horses and 11 cattle in 1783 1 tithe in 1784 and 1785; 4 in 1786 (under 21 yrs – so b. 1766 or after); his own tithe and Thomas Going’s in 1787 (this Drury must have turned 21 in 1787) [PPTL 1782-1850, frames 3, 13, 22, 28, 34, 42, 108, 217, 273]. Greensville County court credited Drury Going with the value of a gun impressed for the public use (during the Revolution) [Orders L 781-9, 13-14]. was listed as the head of a household of seven people in the 1783 census of Greensville County, page 54, near the locations of “Drury Going” and “Thomas Going.” He was taxable in that year on “1 poll, 2 slaves, 2 horses and 8 cattle,” according to “The 1787 Census of Virginia,” page 778. 1784 June 28 Drury Going assignee of Thomas Lyell v Chaney Williams and Mary Williams dismd at defts costs, Order bk 8, p 435, Brunswick Co, Va.
sold 200 acres in Greensville County for 40 pounds on 15 May 1785 [DB l : I06-7]. was a taxpayer in Greensville County in 1787, according to “The 1787 Census of Virginia.” page 778. 1787 Oct 1 – Drury Going of Greensville County on 1 October 1787 when he sold 50 acres on the south side of the Mcherrin River in Brunswick County adjoining Rebecca Stewart’s line [DB 14:366]. Greensville Co, Va.
1787 Oct 21: Drury Going of Greensville Co Va to Daniel Harrison of Brunswick Co Va . . . conveys land in Brunswick on the south side of the Meherrin River containing 50 acres . . . along Harrison’s land to Pompey’s line, to Rebeccah Stewart’s line, to Freeman’s line, to Barnet’s line . . . signed by Drury Going (witnesses omitted). Proved up on June 23, 1788. pgs 366 to 367. Brunswick Co, Va. [DB 14:366]. 1788 June 23 Drury Going acknowledged his indenture of bargain and sale to Daniel Harrison which is ordered to be recorded. Order bk 15, pg 33. Brunswick Co, Va.
Robert Brooks Corn had been bondsman for the marriage of Mark Going, son of Drury Gowen, September 29, 1794.
was bondsman for the marriage of Robert Brooks Corn to Jinsey Jeffers March 26, 1795 in Greensville County. Drury Gowen, [James5, Edward, Jr4, Edward3, William2, Mihil1] son of James Gowen, was born about 1748, probably in Granville County. His father moved back to Brunswick County, Virginia about 1762. Drury Gowen was married about 1769, wife’s name unknown. When Greensville County was organized from Brunswick County in 1781, Drury was living in the new county. 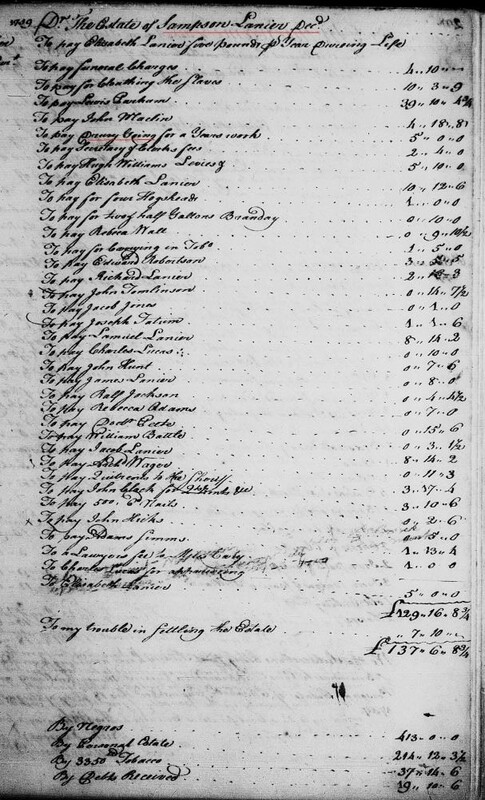 “Drury Going” was a taxpayer in Greensville County in 1787, according to “The 1787 Census of Virginia.” page 778. “Drury Going” was bondsman for the marriage of Robert Brooks Corn to Jinsey Jeffers March 26, 1795 in Greensville County. Robert Brooks Corn had been bondsman for the marriage of Mark Going, son of Drury Gowen, September 29, 1794. “Mark Going” appeared as a taxpayer in adjoining Southampton County in 1830, rendering a tax on “three pigs and Indian land.” For him to have Indian land, his mother would have had to have been a member of the Nottaway Indian tribe, a group that observed matriarchal succession.